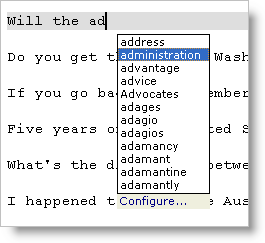 The Auto-Complete List command can be used to force the popup list of matching words to appear in situations when it wouldn't appear naturally on its own. One such case is when an insufficient number of characters has been typed to cause the list to appear. Another case is when the popup list has been configured not to appear at all. For more complete information about Auto-Complete, see the Auto-Complete topic.